Question Of The Week: Are Concerts Too Loud? 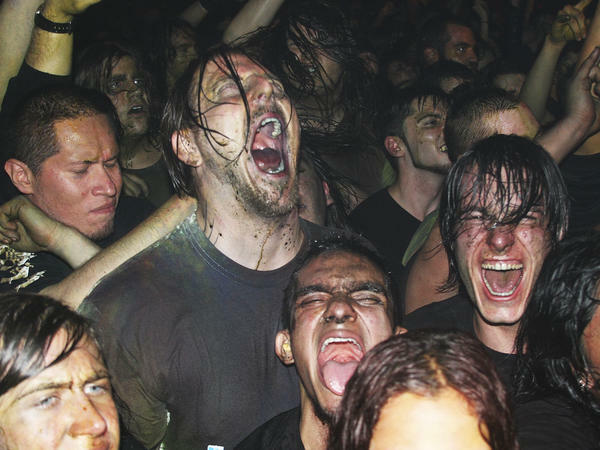 Fans at this GWAR show from the Roseland Ballroom seem to have no problem with the volume. Earlier this week we posted a poll asking whether you think concerts have gotten too loud, and whether you've started wearing earplugs at shows. After a week of voting, the results are in, and respondents have what seems to be a pretty clear message to clubs and concert venues: Turn it down! Of the people who voted, 71 percent said most of the shows they see are too loud, and that the shows seem to have gotten louder in recent years. But people are split on wearing earplugs: 52 percent say they do it; 45 percent of those say they hate it but do it anyway, and 26 percent say they hate earplugs and won't wear them. The debate continues in the comments section below and via twitter @allsongs. At some point we'll take a deeper look at the different kinds of earplugs out there and whether it's possible to still enjoy a show while wearing them. (Original post appears below the photo). This past week I heard more than 60 bands perform in a dozen or so venues as part of the CMJ Music Marathon in New York. It's a music festival scattered all over the city and directed toward people who work in college radio or are otherwise fans of independent music. I love live music and see several hundred shows a year. There's nothing better than that wash of sound and bass vibrating my very being. That said, I'm pretty sure the volume at concerts is getting louder and I'm not really liking it. Some of the increase in volume has to do with technological improvements in concert sound systems. But it also might be that some people simply like it loud, or at least the people in charge of the volume think people want it turned all the way up. Regardless, I find myself reaching for earplugs more often these days and I don't like what they do to the experience. In fact, earplugs deaden the full range of sonics that clubs and bands would like their fans to hear, that very sensation they're after with loud music. So if it's very loud, it's very frustrating. I know someone will want to tell me about a great set of earplugs that won't take away from the range of frequencies. But believe me, while I haven't tried all of them, I have tried many and there's still a trade off. So my question is this: Are concerts too loud? Take our poll and share your thoughts in the comments section below, or via Twitter @allsongs. We'll post the results at the end of the week.